The BIG box arrived today in the big brown truck. Holy cow, what a selection of Proven Winners’ plants to try out and report on in the coming months. The colors and varieties are simply luscious. It’s always like a surprise party when that box arrives, as one well-wrapped pot after another is revealed. I am so excited about the scrumptious ‘Lemon Slice’ Superbells® that are like a lemon meringue pie in a pot. Another mouth-watering selection that emerged from the big box is the Superbells® ‘Watermelon Charm.” I expect that by the time July the 4th rolls around this stunner will be rivaling Old Glory for attention. The velvety-dark ‘Marooned’ coleus almost jumped out of the big cardboard box, its color so vivid. As always you can count on Proven Winners for reliable repeat blooms in an ever-expanding group of annuals choices, and now PW has added a number of perennial selections to its lineup. Stay tuned for the full report on these tempting selections, and be looking for them come next spring. Get one of the bloomin’ Endless Summer® Collection hydrangeas and you could be a winner. The plant collection that blooms all summer long is giving you the chance to win a prize a day all season long! One lucky winner will take home an Endless Entertaining Outdoor Room worth over $20,000! The grand prize features plants from the Endless Summer® Collection, including Endless Summer The Original, Bella Anna, Blushing Bride and Twist-n-Shout. The winner will also be able to choose a beautiful furniture collection from The Outdoor GreatRoom Company. Entering is easy! Visit your local garden center and check out the Endless Summer Hydrangea display. Each plant will feature an entry code on the tag. After purchasing the plant, visit EndlessSummerBlooms.com and input the code on the official giveaway page. Winners will be drawn daily for great Endless Summer prizes, including garden center gift certificates. The sweepstakes runs from May 14 to August 12, 2012. The grand prize winner will be chosen in mid-August. No purchase is necessary. Visit EndlessSummerBlooms.com and click on Official Rules and Regulations for instructions on how to request a code. Look for all four Endless Summer Hydrangeas at better garden centers this spring or order online at http://www.EndlessSummerBlooms.com. 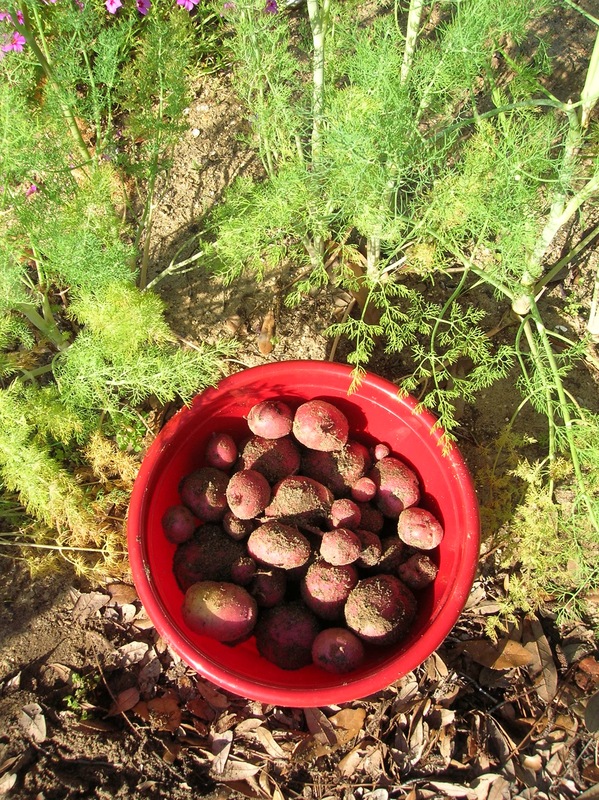 This morning I got out early to beat the heat and harvested my potato “crop.” Considering that the whole thing was an afterthought when I planted two sprouted red bliss spuds I guess it turned out pretty good. I’d estimate I got about three pounds of small new potatoes. The whole crop grew in a four-foot row that I mounded up from time to time and mulched with oak leaves. Harvesting was pretty easy. I started out with a claw-like tool and ended up just going through the loose sandy soil with my hands to located the little spuds. Was it worth the work? I’ll have to answer that one after we have those little potatoes boiled up and seasoned with some of that beautiful dill and butter. I’m guessing they are going to be pretty darn good.